Many visitors to ILBS are pleased by the professional look and feel of the hospital. They encounter smiling staff at the front desk, neat clean and well maintained facilities, kind and cooperative paramedical staff, experienced and highly competent doctors and above all – quick turnaround times across departments. Needless to say, our clients rank us high on patient satisfaction parameters and do not hesitate to visit again! At ILBS we are committed to making available to our patients the best of services in the field of liver and biliary sciences - from diagnostic to therapeutic, from medical to surgical and from curative to palliative. Browse through the links on the left to learn about various disease conditions and treatment modalities related to liver and biliary systems, to see your test reports online, or to know about our consultants and their OPD days. The Outpatient services were shifted to the new and improved quarters in Phase –II building with better consultation chambers and waiting and sub- waiting areas. Out-patient clinics are conducted in sub-specialties like Hepatology, Hepatopancreato-Biliary Surgery, Paediatric Hepatology, Nephrology, Pulmonology, Oncology, Cardiology, Urology and Renal Transplant services. Special Clinics in Nutrition, Neurology, Radiation Oncology and Psychiatric De-addiction have also been started. General OPD clinics are conducted six days a week for the general category of patients at a nominal consultation fee of Rs 20/-. The appointment system was also shifted to a fully electronic platform with display based queue management. The appointment system was also shifted to a fully electronic platform with display based queue management. New wards, both for IPD and for day care, have been opened in Phase-2 building. With this addition, today there are 234 fully functional complement beds : 62 general ward beds, 10 super economy beds, 36 semi private beds, 27 private rooms, 10 deluxe rooms, 22 paediatric ward, 4 VIP suites, 20 Liver coma ICU beds, 2 Liver Coma isolation beds, 15 Surgical ICU Beds, 5 liver transplant ICU beds, 3 oncology and 18 HDU beds). Additionally, there are 87 non-complement beds (10 Dialysis beds; 57 Day care beds), 15 ER beds and 5 Post operative beds. The emergency services are functional 24x7, round the clock on all days. The emergency block is fully equipped with advance monitoring and resuscitation equipments. Services are well organized with dedicated manpower and designated space for triage, observation and admission. The emergency block consists of a Triage Hall having 4 beds and an emergency observation ward with 8 beds. However depending upon number of patient present in the emergency, the additional beds up to total 21 can be placed in the emergency. With starting of the phase –II new building of ILBS, there is a plan to further expand the physical space as well as service facilities of emergency services. Triage System : START and Jump-Start Protocols are used for initial triaging of adult and paediatric patients respectively. Types of patient catered :The emergency services cater to all categories of patients presenting with hepato-biliary and non-hepato biliary clinical conditions across all age groups. However, non-hepato biliary cases are referred to appropriate health care facilities after initial assessment and stabilization. ILBS has in house blood bank and laboratories, providing emergency support to appropriate patients. Liver emergencies:ILBS provides emergency care to patients with all types of liver diseases, presenting in critical condition. ILBS team is well prepared to manage serious patients presenting as Acute Liver Failure (ALF) suitable for emergency transplant surgeries. A team is always ready for retrieval and transport of organs from potential brain dead donors for cadaver transplant. During past year rapid transport of organs from the airport was facilitated to the hospitals through a green corridor created with the support of Delhi police. ILBS is well equipped for handling transportation of sick patients with two basic and one advanced life support ambulances. The BLS ambulances are equipped with an oxygen cylinder, and emergency medications and supplies. The advanced "Liver Ambulance Service", an ALS facility, is available for critically ill patients and the management of such patients is undertaken during the process of transfer to ILBS. This ambulance is fitted with state of the art pre-hospital medical equipment almost identical to the Hospital’s ICUs. The ambulance has the capability to establish and maintain a patient’s airway, defibrillate the heart, stabilize pneumothorax conditions and perform other advanced life support procedures or services, such as cardiac (EKG) monitoring, intubations and ventilation. This ambulance can transport ventilator- supported patients to long distances. Emergency of ILBS also facilitates transfers through air ambulances for patients from far and remote places. The advanced “Liver Ambulance Service”, an ALS facility, is available for critically ill patients and the management of such patients is undertaken during the process of transfer to the ILBS. This ambulance is fitted with the State-of-the-Art pre hospital care medical equipment almost identical to the hospital's ICUs. The ambulance has the capability to establish and maintain a patient's airway, defibrillate the heart, stabilize pneumothorax conditions and perform other advanced life support procedures or services, such as cardiac (EKG) monitoring, intubations and ventilation. This ambulance can transport ventilator supported patients over long distances. Emergency of ILBS also facilitates transfers through air ambulances for patients from far and remote places. The Institute has day care facilities which provide services to patients for short stay procedures like diagnostic and therapeutic endoscopy, ERCP, biliary stenting, endoscopic ultrasound (EUS), Endoscopic Shock Wave Lithotripsy (ESWL), etc. The services are operational from 8 am to 8 pm. Out of the hospital’s total strength of 234 beds, 42 function as ICU beds and 18 have been designated as High Dependency Unit beds. All ventilated patients in the ICU are staffed round the clock with a dedicated nurse in each shift (Nurse:Patient Ratio of 1:1). Close attention is paid to infection control practices in the ICU leading to extremely low rates of ventilator associated pneumonia (VAP) and other HAI indicators. State-of-the-art infrastructure like fully automatic remote controlled patient beds, centralized patient monitoring system, HEPA filters, conferencing facilities, high end ventilators and a well stocked inventory of advanced medical equipment are available. The Institute has eight endoscopy suites for undertaking various endoscopic procedures namely UGI endoscopy, colonoscopy, ERCP, capsule endoscopy, ESWL, diagnostic and therapeutic endoscopic ultrasound, single and double balloon enteroscopy, bronchoscopy, Liver biopsy, Hepatic Venous Pressure Gradient (HVPG) and Trans Jugular Liver Biopsy (TJLB). Major endoscopic procedures are carried out by highly trained faculty assisted by skilled nurses and experienced technicians. At ILBS, a high priority is placed on prevention of transmission of infections and microorganisms from one patient to another. To ensure this, the endoscopes and other accessories are washed, cleaned and disinfected following national and international guidelines in a separate disinfection room. The disinfection room also houses two state-of-art fully automatic endo-washers which are used to treat and disinfect the instruments after every use..
Day care extension ward caters to patients requiring short care services such as blood or body fluid transfusions, albumin infusion, ascitic tapping etc. The ward has eight beds. The Institute has eight endoscopy suites for undertaking various endoscopic procedures namely UGI endoscopy, colonoscopy, ERCP, capsule endoscopy, ESWL, diagnostic and therapeutic endoscopic ultrasound, single and double balloon enteroscopy, bronchoscopy, Liver biopsy, Hepatic Venous Pressure Gradient (HVPG) and Trans Jugular Liver Biopsy(TJLB). Major endoscopic procedures are carried out by highly trained faculty assisted by skilled nurses and experienced technicians. At ILBS, a high priority is placed on prevention of transmission of infections and microorganisms from one patient to another. To ensure this, the endoscopes and other accessories are washed, cleaned and disinfected following national and international guidelines in a separate disinfection room. The disinfection room also houses two state-of-art fully automatic endo-washers which are used to treat and disinfect the instruments after every use. The institute has started a thirteen bedded HDU to cater for patients who require close monitoring but are not critical enough to require admission in ICU. This also helps in shifting the patients from the ICU. One of the beds is designated as an isolation bed for immunocompromised or immunodeficient patients. The institute has six fully equipped state-of-the-art modular operating rooms (OR). Two ORs are dedicated to the liver and renal transplant surgery and four OR are for other surgical procedures. The ORs are equipped with latest equipments like Ultrasonic Surgical Aspiration System, Argon Beam Coagulator, Thromboelastograph, Cell Saver, Rapid Infusion System, Cardiac Output Monitor, Veno-Venous Bypass Pump, Fibro-Optic bronchoscope, Video-bronchoscope, Video-choledochoscope, HD Surgical Light Camera System, central anaesthesia Monitoring System and HD laparoscopic Monitor System. The phlebotomy area is a dedicated area for the collection of samples from OPD patients. Trained phlebotomists who collect samples observe all the standard precautions. After collection, each vaccutainer is bar-coded with the patient’s details. The lab reception receives samples from the OPD as well as IPD. On reception at the counter, each sample is acknowledged onto the hospital information system (HIS) and then distributed into the respective labs. 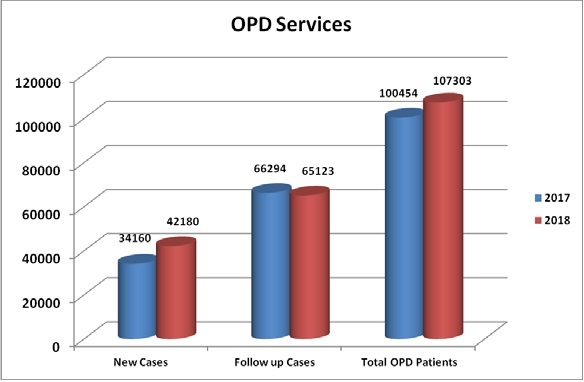 In 2016, the phlebotomy services were shifted to the ground floor of the second phase building along with OPD services. The patients are now serviced through a queue management token based system to avoid patient harassment during waiting. All lab reports are also now dispatched through the phlebotomy counter itself.